Using Argonne's Mira supercomputer, researchers are developing advanced models to study magnetic field generation on Earth, Jupiter, and the Sun at an unprecedented level of detail. A better understanding of this process will provide new insights into the birth and evolution of the solar system. After a five-year, 1.74 billion-mile journey, NASA’s Juno spacecraft entered Jupiter’s orbit in July 2016, to begin its mission to collect data on the structure, atmosphere, and magnetic and gravitational fields of the mysterious planet. For UCLA geophysicist Jonathan Aurnou, the timing could not have been much better. Just as Juno reached its destination, Aurnou and his colleagues from the Computational Infrastructure for Geodynamics (CIG) had begun carrying out massive 3D simulations at the Argonne Leadership Computing Facility (ALCF), a U.S. Department of Energy (DOE) Office of Science User Facility, to model and predict the turbulent interior processes that produce Jupiter’s intense magnetic field. While the timing of the two research efforts was coincidental, it presents an opportunity to compare the most detailed Jupiter observations ever captured with the highest-resolution Jupiter simulations ever performed. Aurnou, lead of the CIG’s Geodynamo Working Group, hopes that the advanced models they are creating with Mira, the ALCF’s 10-petaflops supercomputer, will complement the NASA probe’s findings to reveal a full understanding of the Jupiter’s internal dynamics. But Aurnou and his collaborators are not just looking at Jupiter. Their three-year ALCF project also is using Mira to develop models to study magnetic field generation on the Earth and the Sun at an unprecedented level of detail. Magnetic fields are generated deep in the cores of planets and stars by a process known as dynamo action. This phenomenon occurs when the rotating, convective motion of electrically conducting fluids (e.g., liquid metal in planets and plasma in stars) converts kinetic energy into magnetic energy. A better understanding of the dynamo process will provide new insights into the birth and evolution of the solar system, and shed light on planetary systems being discovered around other stars. Modeling the internal dynamics of Jupiter, the Earth, and the Sun all bring unique challenges, but the three vastly different astrophysical bodies do share one thing in common—simulating their extremely complex dynamo processes requires a massive amount of computing power. To date, dynamo models have been unable to accurately simulate turbulence in fluids similar to those found in planets and stars. Conventional models also are unable to resolve the broad range of spatial scales present in turbulent dynamo action. However, the continued advances in computing hardware and software are now allowing researchers to overcome such limitations. With their project at the ALCF, the CIG team set out to develop and demonstrate high-resolution 3D dynamo models at the largest scale possible. Using Rayleigh, an open-source code designed to study magnetohydrodynamic convection in spherical geometries, they have been able to resolve a range of spatial scales previously inaccessible to numerical simulation. While the code transitioned to Mira’s massively parallel architecture smoothly, Rayleigh’s developer, Nick Featherstone, worked with ALCF computational scientist Wei Jiang to achieve optimal performance on the system. Their work included redesigning Rayleigh’s initialization phase to make it run up to 10 times faster, and rewriting parts of the code to make use of a hybrid MPI/OpenMP programming model that performs about 20 percent better than the original MPI version. When the project began in 2015, the team’s primary focus was the Sun. An understanding of the solar dynamo is key to predicting solar flares, coronal mass ejections, and other drivers of space weather, which can impact the performance and reliability of space-borne and ground-based technological systems, such as satellite-based communications. The team began by performing 3D stellar convection simulations of a non-rotating star to fine-tune parameters so that their calculations were on a trajectory similar to observations of flow structures on the Sun’s surface. Next, they incorporated rotation into the simulations, which allowed them to begin making meaningful comparisons against observations. This led to a paper in Astrophysical Journal Letters last year, in which the researchers were able to place upper bounds on the typical flow speed in the solar convection zone. The team’s research also shed light on a mysterious observation that has puzzled scientists for decades. The Sun’s visible surface is covered with patches of convective bubbles, known as granules, which cluster into groups that are about 30,000 kilometers across, known as supergranules. Many scientists have theorized that the clustering should exist on even larger scales, but Featherstone’s simulations suggest that rotation may be the reason the clusters are smaller than expected. 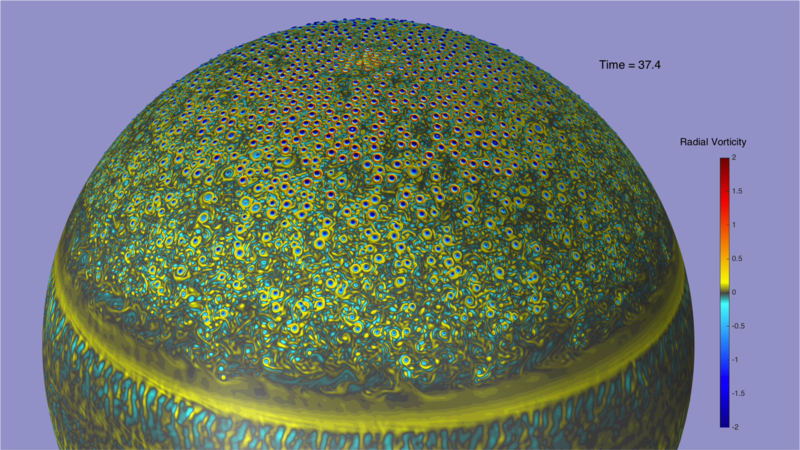 According to Featherstone, these new insights were enabled by their model’s ability to efficiently simulate both rotation and the Sun’s spherical shape, which are extremely computationally demanding to incorporate together in a high-resolution model. “To study the deep convection zone, you need the sphere,” he said. “And to get it right, it needs to be rotating." Magnetic field generation in terrestrial planets like Earth is driven by the physical properties of their liquid metal cores. However, due to limited computing power, previous Earth dynamo models have been forced to simulate fluids with electrical conductivities that far exceed that of actual liquid metals. To overcome this issue, the CIG team is building a high-resolution model that is capable of simulating the metallic properties of Earth’s molten iron core. 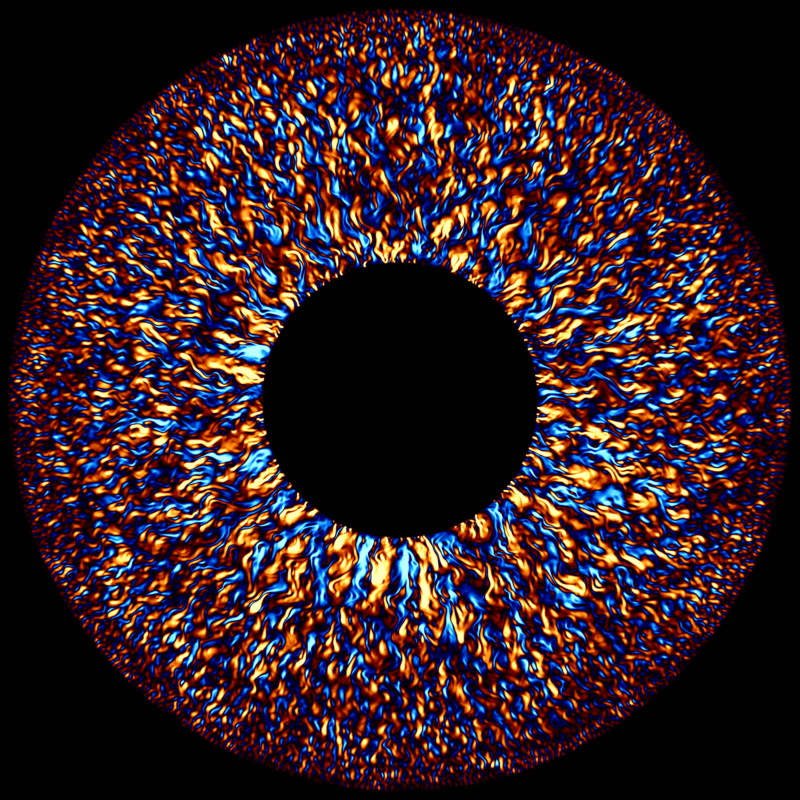 Their ongoing geodynamo simulations are already showing that flows and coupled magnetic structures develop on both small and large scales, revealing new magnetohydrodynamic processes that do not appear in lower resolution computations. In Jupiter’s case, the team’s ultimate goal is to create a coupled model that accounts for both its dynamo region and its powerful atmospheric winds, known as jets. This involves developing a “deep atmosphere” model in which Jupiter’s jet region extends all the way through the planet and connects to the dynamo region. Thus far, the researchers have made significant progress with the atmospheric model, enabling the highest-resolution giant-planet simulations yet achieved. The Jupiter simulations will be used to make detailed predictions of surface vortices, zonal jet flows, and thermal emissions that will be compared to observational data from the Juno mission. Ultimately, the team plans to make their results publicly available to the broader research community. This project was awarded computing time and resources at the ALCF through the Innovative and Novel Computational Impact on Theory and Experiment (INCITE) program supported by DOE's Office of Science. The development of the Rayleigh code was funded by CIG, which is supported by the National Science Foundation.